from your drinking water, bath and shower water? to the chlorine, leaving your hair brittle and your skin itchy and flaky. and acts as a pollutant. from our drinking water before drinking it! Doesn't it make sense to filter shower and bath water too? Remember, your skin is your largest organ! UNDERSTAND THE PROFOUND DANGERS OF CHLORINE!! Some of nature's most valuable and essential anti-cancer and anti-disease phytochemical nutrients, which are commonly found in food, have been discovered to form deadly cancer causing substances when consumed or combined with chlorinated tap water. This discovery includes familiar foods including soy, fruits, vegetables, tea, many health products, and some prescriptions. Recently, a joint study was undertaken in Japan by research scientists at the National Institute of Health Sciences and Shizuoka Prefectural University. They determined that natural organic substances react when exposed to chlorinated tap water, forming dangerous cancer causing compounds named MX, which stands for "Unknown Mutagen". They are similar to the already well-known and more easily detected cancer causing THMs (trihalomethanes). It is certain that the fresh plant foods we eat similarly react with the chlorinated tap water we drink with our meals, creating toxins.This means that fresh fruits and vegetables, green salads, green tea, black tea, herb teas, soy products, vitamins and various health supplements, and even some pharmaceutical drugs all can be implicated in combination with chlorinated water. The dangerous cancer causing agents which are produced are extremely toxic in infinitesimal amounts so small and obscure that they are very difficult to detect. Very little chlorine is required to be dangerous. Many years ago laws were passed making chlorination of water mandatory. Now, the chlorine industry and government agencies must continue their existing policies. If sudden or drastic changes are made the legal liabilities would be staggering. This predicament could make the tobacco industry scandal seem insignificant in comparison.Educating people to the dangers of chlorine would be admitting to knowledge of the problem, which could invalidate past studies and certainly raise serious legal problems. Although Chlorine has essentially eliminated the risks of waterborne diseases such as typhoid fever, cholera and dysentery, there are many pathogens that are not controlled by chlorine.Better methods of water treatment exist, such as ozonation, and many alternatives are already used throughout the world. This message is of utmost importance to the general public, because chlorine will one day, hopefully in the near future, be exposed as a major cause and contributor to cancer and degenerative disease. Chlorine will also be found to be responsible for damaging theimmune and hormonal systems by mutating the food-based plant estrogens and phytochemicals that support those systems.A healthy internal environment and immune system should be your first and best line of defense against disease. 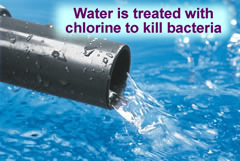 Eliminate or reduce all chlorine wherever possible. Don’t drink chlorinated tap water. Water ionizers not only remove the chlorine, but add beneficial alkalinity and oxygen. It is well known that Cancer and disease cannot live in an oxygenated, alkaline environment, as demonstrated by Dr. Otto Warburg who won the NobelPrize in Medicine in 1931 for his discovery of the oxygen transferring enzyme of cell respiration." It is indisputable that all cancer could be prevented if the respiration of body cells were kept intact." - excerpt from Dr. O. Warburg's Address to Nobel Laureates at Lindau, Lake Constance, Germany, June 30, 1966!! Chlorine, # 17 on the Periodic Table of Elements, is by itself a yellow-green poisonous gas. 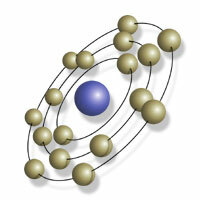 It is an inorganic element that cannot exist by itself in nature but needs to bond to another element, the most common being sodium, hence, sodium-chloride, or salt. In fact, commercial chlorine is produced by sending an electrical charge through a salt water solution, disrupting the bond between chlorine and sodium. The free chlorine is then captured and used for numerous household and industrial applications. About 180 years ago, scientists, while researching the prevention of typhoid in the water supply, discovered that chlorine, bonding to organic substances, such as bacteria, killed it and rendered the water potable. Because of the corrosive effect chlorine had on organic matter, it was used as a horrendously effective weapon (Mustard Gas!) during World War One.By nature, the gas, which is heavier than air, stayed close to the ground and destroyed the soldier's lungs. Today, chlorine is still used as the primary method for disinfecting municipal water supplies, swimming pools, and whitening laundry. Chlorine's attraction to, and corrosion of organic material doesn't end with the bacteria in the water. Chlorine also attacks your hair, skin, and lungs, as they are organic as well. 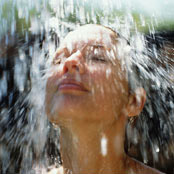 Chlorine can leave your hair dry and brittle and make your skin flaky and itchy. It can also trigger negative reactions in children, the elderly, and people with chlorine-sensitivity. Chlorine in shower and bath water is readily absorbed by our skin and inhaled from the steam and spray.In a quick ten-minute shower, we can absorb up to 600% more contaminants than in the drinking water for the day.And being bombarded by this toxin on a daily regular basis compounds the damage.Studies have shown that for health reasons it is best to remove chlorine from drinking water. Why not do the same with our shower and bath water? The following is an excerpt from the best documented information on the subject of chlorinated water in the shower. This was published in the Australian Magazine, Nature & Health. Vol. 10. No. 4., Issue Summer 1989.Article published by: Whedon Young Productions Pty. Ltd. 372 Eastern Valley Way, Chatswood, New South Wales 2067, Australia From "One Hundred Years Of Water Chlorination", Pages 44-49, by John F. Ashton, Chief Chemist Australian Food Research Laboratories and by Dr. Ronald S. Laura, Professor in Education, University of Newcastle and Chairman, Sports Medicine and Health Education Committee, Hunter Academy of Sport, New South Wales. There is another side to the chlorine-water story.When we return from a gym workout or a jogging session or a game of squash, not only are we thirsty but we usually shower or bathe.We have been taught that cleanliness and health go together, and indeed they do, when chemical-free water is used.When chlorinated water is used, however, bathing may be much less healthy than we ever supposed. Gasses are as a rule less soluble in hot water, and when water is heated or boiled, dissolved gasses are released.Boiling water is as we noted earlier a way in which the free chlorine content in water is greatly reduced, the chlorine escaping into the air.When we have a hot shower or run a bath we can sometimes smell the chlorine released as it escapes from the hot water.In a confined shower recess, especially one with poor ventilation, the chlorine escapes from the water as we continue the hot shower and steadily increases in concentration in the air we breathe.The olfactory threshold for chlorine is about 3.5 PPM (parts per million) so when we can smell chlorine the concentration is already above this level.The lethal concentration for ten-minute exposure is about 600 PPM andregularly taking hot showers with chlorinated water could pose a health risk. Chlorine causes pulmonary edema, and it would seem likely that regular exposure to chlorine gas even at low levels such as in normal showering may reduce the oxygen transfer capacity of the lungs.This could be a critical factor for athletes and for others prone to heart failure. Another aspect to be considered is our skin.Our skin is an important protective barrier for our bodies.When we shower with chlorinated water we are essentially exposing our skin to a relatively large volume of a dilute chlorine solution.Some of this chlorine reacts with the oils in the skin to form chlorinated compounds and it is these compounds which may then be absorbed by the body.It seems very likely, considering the strong oxidizing power of chlorine, that regular exposure to chlorinated water serves also to promote the aging process of the skin, not unlike extended exposure to sunlight.Moreover, chlorine may actually enhance the aging effects of ultraviolet radiation by reinforcing the process of cell deterioration. Another skin factor to be considered with the destruction by chlorine of the natural bacteria balance on our skin.Our skin has an ecology, all of its own, which needs to be preserved in order to maintain healthy skin and its associated beauty. 1. Hodges L., Environmental Pollution, (N.Y. : Holt, Reinhart and Winston, 2nd Ed., 1977, p. 189). 2. Llewllyn, W. J., Journal American Medical Association, Vol. 146, No. 13, 1951, P. 1273. 3. Sinclair, H.M. (Cited by Clark,L., Get Well Naturally, N.Y.: ARC Books, 1971, P.327). 4. Passwater, R.A., Super-Nutrition for Healthy Hearts, N.Y.: Jove Publications Inc., 1987, pp.155 - 156). 5. Price, J.M., Coronaries, Cholesterol, Chlorine, Banhadlog Hall, Tyliwch, Llandridloes: Pyramid Publications Ltd., 1984, pp. 32,33). 6. "Atherosclerosis may start with cell proliferation" Journal American Medical Association. Vol. 227,No.7, 1974,p.734). 7. Revis, N.W., McCauley P., Bull R., and drinking water disinfectants to plasma cholesterol and thyroid hormone levels in experimental studiesâ€™, Proc. National Academy of Science, USA Vol. 83, March 1986, p. 1485. p. 1489. 8. "Preliminary Assessment of Suspected Carcinogens in Drinking Water' Report to Congress, US Environmental Protection Agency, Washing D.C., 1975. 9. "Water Contaminated Throughout US", Chemical & Eng. News, 28 April, 1075,p.19. 10. Dowty, B., Carlisle, D. Laseter, J.L. "Halogenated Hydrocarbons in New Orleans Drinking Water and Blood Plasma", Science, Vol. 187, 1975, pp.75-77. 11. Pate, T., Harris, R.H. Epstein, S.S., "Drinking Water and Cancer Mortality in Louisiana", Science, Vol. 193, 1976, pp.55-57. 12. Trehy, M.L. and Bieber, T.I., "Detection, Identification and Quantitative Analysis of Dihaloacetonitriles in Chlorinated Natural Waters?, in Keith, L.H., (Ed.) Advances in Identification and Analysis. with ultra filtration from a water ionizer! We are here to help you, because, YOU are paramount!